Small enough to fit 5th wheels, towables and propane-equipped motorhomes. Powerful enough for family comfort. 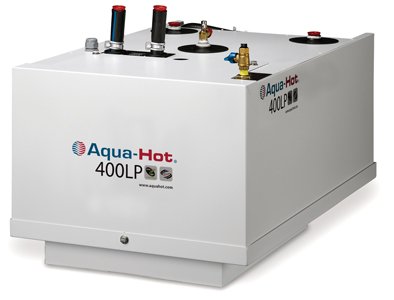 The 400P is propane-fueled and equipped with an AC electric heating element. This single unit delivers quiet, even, draft-free heat circulation, plus a constant flow of hot water. It's a level of comfort multiple system installations don't approach.